The next day I researched local dance class options, and signed the two of us up for jitterbug and swing lessons. As I remember, my boyfriend was less than thrilled but he was nice enough to humor me. From the beginning, I was hooked. I loved the music, the moves, the exercise, and the community. Even though it was a challenge to learn the steps, I had a clear vision of where I wanted to end up: I longed to be able to dance like that couple. The boyfriend didn’t last, but my love of dancing did and, to this day, it is one of my favorite things to do. I was reminded of my first dance epiphany when I read a recent post by Donna on her blog Retirement Reflections, in which she wrote about a retired friend who was learning how to dance. Because this friend enjoyed dancing at her high school reunion so much, she decided to sign up for lessons. Much like me, she discovered – then embraced – a hidden passion. I was in my late twenties when I took my first dance lessons. At first it was just jitterbug and swing, but soon I was also learning to waltz, foxtrot, cha-cha, tango, and even to do the hustle (remember that??). I was never what anyone would call a gifted student, but I enjoyed the challenge and loved learning different dance styles. Learning to dance has introduced a lot of positive aspects to my life and I often encourage others to give it a try. Many classes don’t require having a partner – in fact you will become a better dancer when you dance with a variety of partners. You can pick just one type of dance, or branch out as your skills and interest develop. If you are looking, taking dance lessons can be a great way to meet someone special. 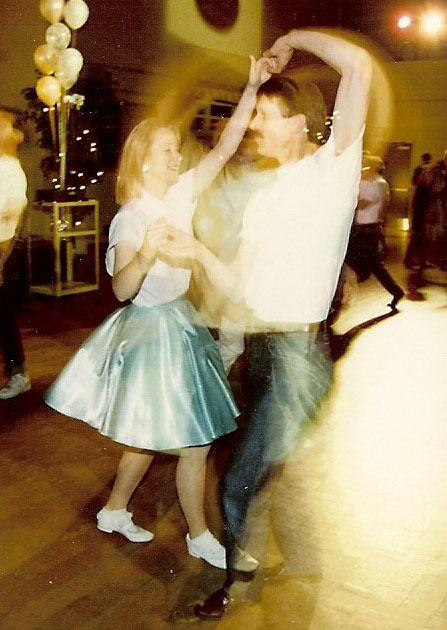 I met my husband 26 years ago in a jitterbug class and dancing became our early connection. Although my husband and I haven’t taken lessons for years and the opportunities to go dancing don’t present themselves as often as they used to, we still enjoy getting out on the dance floor when we can. Our moves are a little rusty and we sometimes struggle to get in rhythm with each other again, but soon, the muscle memory returns and we start to glide across the floor just like that couple did so many years ago. Good for you! I love to dance but am married to a man with two left feet. Really! We did lessons twice and he still struggles. That doesn’t stop us from dancing though. We may not look like the polished couple but we have a good time. I’m so glad that he dances even though he doesn’t feel completely comfortable. It’s all about having fun! I signed hubs up for a couple of dance lessons recently, thinking that we could learn to dance like those couples who look like they’ve been dancing together for a lifetime. But alas, horse…water…drinking…nope, it didn’t happen. Insert sigh here. You are a lucky woman! I feel very lucky! When we are out on the floor, I see so many women on the sidelines who look like they wish their husbands would dance with them. I’m not sure why so many men feel uncomfortable… it’s not that hard. I’m so glad that you shared this with Louise! After all, her story inspired my post. I love that she is out there having fun! I remember the party well even though it was 26 years ago; my friend threw herself a big bash and we all dressed in 50s costumes (men had it easy: just jeans and a white T-shirt). I hope you dance a lot – either alone or with a partner! I think we are both rhythmically challenged (him more than me) but can manage *ceilidh dancing – off to a charity ball tonight and sincerely hoping they have a ceilidh band! *Scottish country dancing for anyone who needs a translation. Wow, I don’t know about ceilidh dancing… it sounds like fun! I hope the band was playing your music. Well, they did for one part of the evening! We enjoyed ourselves, thanks. But if not for those two motivators, hubby’s reluctance to dance would still be firmly in place. Since then we have caught various other classes from time to time and learned new steps while on the floor at other times. I am still not the most co-ordinated body out on the dance floor, but it is all you say it is! Yay, another dancer! I think you hit the nail on the head… it’s not about doing the moves perfectly, it’s about getting out there and having fun! I love the Red Hot Chile Peppers too. Janis, I love your story and the list of positive attributes to dancing. You can take it with you on trips. While your first dancing partner did not last, he was indeed a trooper for going along. My wife and I need to do this, as we need to learn how to better dance together. Yes, you need to do that! Your wife is lucky that she has a willing partner. Good for you Keith! Aww . . . I love this story! I think there are many women who long to dance, but don’t, because they have a reluctant partner. Good for you, signing up for those lessons. My parents met at a ballroom in 1946 and married a few months later. After that, they continued dancing for decades. I think men have been told for so long that they aren’t naturally graceful like women are (and, of course, neither is true) so they are reluctant to try. In my opinion, men who dance have an advantage over men who don’t… I don’t understand why more don’t learn when they are dating. I agree, Janis. With my parents, it was my dad who really encouraged the dancing. I always thought that was so cool. Enjoyed your dance memoir. I was not blessed with a partner who would agree to dance. My former husband danced at our wedding, but only because he had to. Later on, in the disco era, we went out dancing with other couples, but I ended up sitting at a table with a cocktail most of the time. I regret not having more opportunities to dance. I’ve been living alone for more than 25 years, and really miss the fun of dancing. Many of the dance studios in my area welcome single students. You are suppose to rotate partners anyway so it really doesn’t matter if you come with someone or not. I think a lot of men dance at their wedding than never again. What a shame… they don’t know what they are missing! I envy couples who can break out the moves on the dance floor. We were recently at a wedding and there was a much older couple in attendance – well into their 80s – who looked very frail and hesitant … until they stepped on the dance floor. It was a thing of beauty. The energy and grace they displayed was amazing. They danced all evening! So much for being frail. Sadly, I will never be one of those …. Oh my gosh, I hadn’t read that dancing post before… too funny! It sounds like you may have had some lousy teachers. At least your husband still loves to dance so you don’t have to sit on the sidelines like so many women do. I love your story about the older couple… I hope that is my husband and me in 20 years! I suspect it will be you in 20 years 🙂 Keep dancing! I love this, Janis! Dancing is such a great leisure activity and something that can last for a lifetime! Loved the photo of you dancing! You are right, it can last a lifetime and can be transported all over the world. I have fond memories of dancing in Cuba to the music of a fantastic jazz band. A couple of people have mentioned less-than-inspiring teachers. We were lucky enough to have several great teachers who made learning fun and didn’t call people out for their mistakes… yikes! I don’t remember that scene from When Harry Met Sally, but I’m sure Billy Crystal looked maaarvelous! Oh, yes! That is definitely on the list!